The eherold was founded in the late Eighties. It supplemented the already existing international register GWF – “The General Register of Arms-bearing Families” and added a further dimension in the form of the Internet. Previously, publications had only been available in book form, but were now available world-wide – even as far as Mount Everest. The registrations it contains are mostly those from the Dochtermann archives and his successors, as well as from Pro Heraldica. The eherold has always been accessible via the internet but its dissemination was limited by language to the German-speaking world. Today, it is impossible to envisage a world without the Internet. Just how important it is today can be seen in the example of the Google group which was founded in 1998 and has even given rise to a new verb – today, the world “googles”. Not least through the foundation of Pro Heraldica we have been increasingly confronted with enquiries about the registration of coats-of arms and in particular with the matter of international registration – an issue which eherold has taken up. 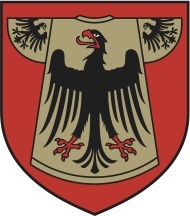 The responsibility for eherold is shared between the Herald and Pro Heraldica, Deutsche Forschungsgesellschaft für Heraldik und Genealogie mbH and that is the reason why the language of erehold was originally German. 1960 saw the setting up of the Deutsche Heraldische Gesellschaft – the Wappen-Herald. Our objective was to awaken new interest in heraldry in Germany – an interest reaching beyond late-romantic idealization, rapturous sentiments and ideological involvement but with more sober pragmatism and an objective view on the future of its disciplines in an age of social changes. Taking interest in heraldry as a general cultural phenomena is often a side-effect of investigations into one’s own family history but at the same time it is also expresses positive involvement in politics which manifests itself in an increasing interest in public heraldry i.e. the coats of arms of states, cities and communities. The main driving force behind becoming an involvement with heraldry however remains to lie within one’s own family where the main activity field of innovative forces already exists. Almost everyone can access this field of study relatively easily - after all most people have details of their parents, brothers and sisters and children and normally it is simple enough to obtain this data and have it confirmed. But things do not usually end there and even the next step involves possibly having to overcome unexpected obstacles. If we come up against such obstacles or are faced with a veritable heap of obstacles that is when we need the help of others. Help, which can only be forthcoming from experienced people. There is many an amateur out there who through experience has become really proficient in the subject. A long sleeveless tunica worn over the armour known as a surcoat or tabard; it was the official attire or vestment of the Herald and a sign of the prominent position afforded him through his knowledge. Some of the surcoats still preserved show the coats-of-arms of German Prince Regnants as feudal lords of heralds. Some of them are decorated with what was later to become the symbol of the German nation i.e. a black eagle on a golden background. 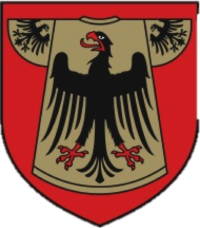 Together with the caduceus herald’s staves and the national colours gold, red and black it forms the symbol of the Wappen-HEROLD Deutsche Heraldische Gesellschaft e.v. Collaboration in lexical works including periodicals, essays in journals and newspapers, advertising and image series etc. (If you are interested in reading or downloading the comprehensive list of publications, we can place them at your disposal in German). On our webpages, we present you with heraldically correct coats-of-arms from all over the world; arms which have been checked for correctness by experts in the respective country. Globalisation is one of the top issues of our times. Everything is becoming more and more international and therefore it is all the more important that your family arms enjoy international protection. By registering your family coat-of-arms with Wappen Herold you ensure that it is legally protected worldwide. We cooperate with a network of internationally reputed heralds. Eherold also provides professionals and anyone interested in the subject with an opportunity to access information on the current status of contemporary heraldry in various countries of the world. Such information is essential because heraldic rules or the entitlement to bear a coat- of-arms can vary from country to country. The presentation of a family coat-of-arms on eherold.org can be called on worldwide to safeguard the priority claim – regardless of the legal factors in the 193 countries in the world. The global announcement of the family coat-of-arms forms a basis alone for internationally documenting its priority. For more than 45 years, the Wappen-Herold, Deutsche heraldische Gesellschaft e.V. in Germany has been working closely together with Pro Heraldica and also maintains close contacts with the International Academy of Genealogy, founded 1998 in Turin (Italy), and the International Acadamy of Heraldry (Académie Internationale d'Héraldique), founded 1949 in Paris. Both academies were established in order to bring together genealogists and heraldry experts from all over the world. The objective of the genealogical academy is to promote and coordinate genealogical studies at an international level, to organize colloquia and to have genealogy recognized as a true discipline within the humanities worldwide. The objective of the heraldic academy is to centralize heraldic studies on the basis of as much international cooperation as possible. You need to be elected to have a place in the Academy and the number of active academics is limited to 75. 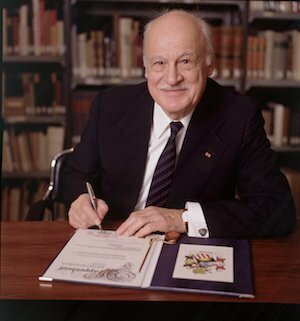 Dr. Rolf Sutter, Chairman of Wappen Herold is a member of both academies.